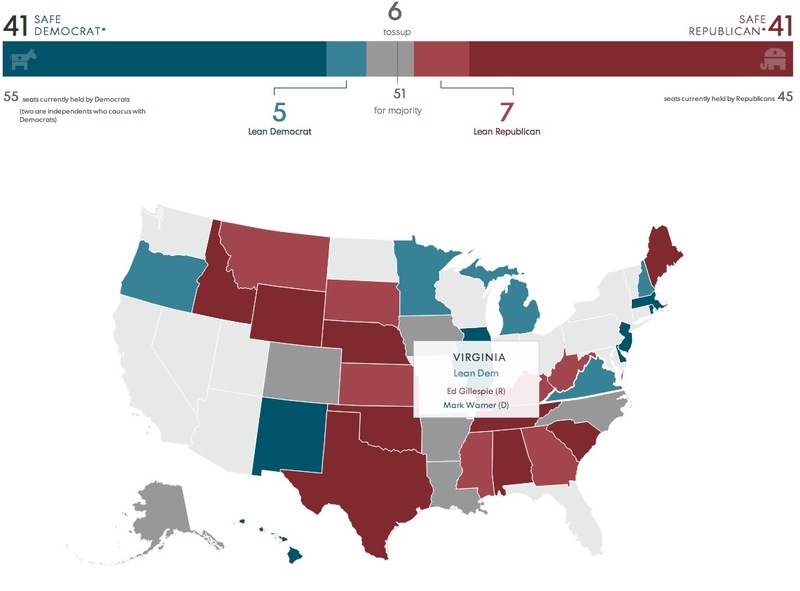 With more than 1,300 candidates, 507 races, top-line campaign finance data and poll averages for select races, the 2014 midterm elections forecast app we launched in early September is probably the most complex mash-up of data, APIs and home-grown content built yet by our Interactive Applications team at Gannett Digital. We’re happy with the results — even more because the app is live not only at USA TODAY’s desktop and mobile websites but across Gannett. With the rollout of a company-wide web framework this year, we’re able to publish simultaneously to sites ranging from the Indianapolis Star to my alma mater, The Poughkeepsie Journal. What’s in the forecast? Every U.S. House and Senate race plus the 36 gubernatorial races up in November with bios, photos, total receipts and current poll averages. For each race, USA TODAY’s politics team weighed in on a forecast for how it will likely swing in November. Check out the Iowa Senate for an example of a race detail page. Finally, depending on whether you open the app with a desktop, tablet or phone, you’ll get a version specifically designed for that device. Mobile-first was our guiding principle. This was a complex project with heavy lifts both on design/development and data/backend coding. As usual, I handled the data/server side for our team with assists from Sarah Frostenson. — The Project Vote Smart API supplies all the candidate names, party affiliations and professional, educational and political experience. Most of the photos are via Vote Smart, though we supplemented where missing. — The Sunlight Foundation’s Realtime Influence Explorer API supplies total receipts for House and Senate candidates via the Federal Election Commission. — From Real Clear Politics, we’re fetching polling averages and projections for the House (USAT’s politics team is providing governor and Senate projections). Python scrapers fetch data into Postgres, running on an Amazon EC2 Linux box. A basic Django app lets the USAT politics team write race summaries, projections and other text. Postgres is the DB here also. Python scripts query Postgres and spits out the JSON files, combining all the data for various views. We upload those files to a cached file server, so we’re never dynamically hitting a database. Front-end work was a mix of data-viz and app framework lifting. For the maps and balance-of-power bars, Maureen Linke (now at AP) and Amanda Kirby used D3.js. Getting data viz to work well across mobile and desktop is a chore, and Amanda in particular spent a chunk of time getting the polling and campaign finance bar charts to flex well across platforms. For the app itself, Jon Dang and Rob Berthold — working from a design by Kristin DeRamus — used Backbone.js for URL routing and views. Rob also wrote a custom search tool to let readers quickly find candidates. Everything then was loaded into a basic template in our company CMS. This one featured a lot of moving parts, and anyone who’s done elections knows there always are the edge cases that make life interesting. In the end, though, I’m proud of what we pulled off — and really happy to serve readers valuable info to help them decide at the polls in November. Let’s say you want to generate a few hundred — or even a thousand — flat JSON files from a SQL database. Maybe you want to power an interactive graphic but have neither the time nor the desire to spin up a server to dynamically generate the data. Or you think a server adds one more piece of unnecessary complexity and administrative headache. So, you want flat files, each one small for quick loading. And a lot of them. A few lines of Python is all you need. I’ve gone this route lately for a few data-driven interactives at USA TODAY, creating JSON files out of large data sets living in SQL Server. Python works well for this, with its JSON encoder/decoder offering a flexible set of tools for converting Python objects to JSON. 1. If you haven’t already, install Python. Here’s my guide to setup on Windows 7; if you’re on Linux or Mac you should have it already. 2. In your Python script, import a database connector. This example uses pyodbc, which supports connections to SQL Server, MySQL, Microsoft Access and other databases. If you’re using PostgreSQL, try psycopg2. 4. Here’s an example script that generates two JSON files from that query. One file contains JSON row arrays, and the other JSON key-value objects. Below, we’ll walk through it step-by-step. Given that median is such a valuable statistical measure, it’s baffling that Microsoft’s SQL Server and other relational databases (MySQL, PostgreSQL) don’t have a built-in MEDIAN function. Well, this week, after working through a data set in SQL Server — and deciding I didn’t want to push the data into SPSS to find medians — I hit the web to find a T-SQL workaround. I found a ton of solutions (some from people with no clue about the difference between median and average), but the one below — adapted from a post by Adam Machanic at sqlblog.com — was the best. It produces accurate results and is fairly speedy to boot.